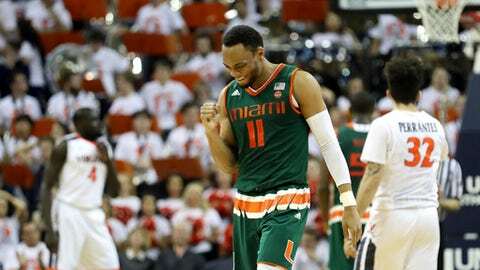 CHARLOTTESVILLE, Va. (AP) Bruce Brown had a tough night from the field, and yet, with the ball in his hands and Miami in need of a basket, the freshman guard put his faith in loads of summertime shooting work. Brown made a 3-pointer with 23.8 seconds left in overtime and the Hurricanes beat No. 18 Virginia 54-48 on Monday night for the Cavaliers’ fourth straight loss. ”I caught it in rhythm, and my only thought was to put it up because he was playing a bit off me,” Brown said. The 3-pointer was only his second field goal of the night, but it gave Miami a 50-48 lead. Brown scored 14 points to lead the Hurricanes (19-8, 9-6 Atlantic Coast Conference) to their third consecutive victory, moving them out of a tie with Virginia and into sixth in the league. Kamari Murphy and Dejan Vasiljevic added 10 points each. Devon Hall scored 15 points to lead Virginia (18-9, 8-7), which lost its fourth in a row for the first time since Tony Bennett’s first season as coach in 2009-10. Isaiah Wilkins added 10 points and 10 rebounds, including two free throws with four seconds left in regulation to tie it. Bennett especially lamented that the Cavaliers couldn’t pull it out on a night they honored last year’s ACC player of the year and defensive player of the year Malcolm Brogdon, now with the NBA’s Milwaukee Bucks, by retiring his No. 15 jersey. The offensively challenged Cavaliers used 12-0 run in a span of 2:24 to open a 35-24 lead with 12 minutes to play, but just as quickly, they went cold, not scoring for nearly six minutes thereafter. Miami thought it had won when Reed hit a 3-pointer at the end of the second half, but a video review was used to determine he released the ball just after the buzzer. In the overtime, a putback by Marial Shayok with 39 seconds left gave the Cavaliers a 48-47 lead, but Brown made his only 3-pointer of the game on the Hurricanes’ ensuing possession, and Miami sealed it at the free-throw line. The made 20 of 22 free-throw attempts. Virginia’s lone senior and top scorer, London Perrantes, had his fourth forgettable game in a row, scoring just four points. During the Cavaliers’ losing streak, he’s made 16 of 58 attempts, just 27.6 percent, and just 5 of 28 3-point tries. He’s also averaging 37.5 minutes in those games, which include a double-overtime game and Monday night’s overtime. ”I think at this time of the year, you probably see signs of fatigue in all players,” Larranaga said. Miami: The Hurricanes have only nine scholarship players on their roster, and only eight were available against Virginia because junior guard Ja’Quan Newton was sitting out the final game of a three-game suspension for violating team rules. Of the eight remaining, four are true freshmen and two of them, Vasiljevic and Brown, hit the biggest shots of the night at John Paul Jones Arena. Virginia: The Cavaliers had difficulty scoring in the previous two games, with a scoring average of 48 points in losses to Duke and North Carolina. The 12-0 run was a surprising departure from those struggles, but the Cavaliers missed the front end of three consecutive 1-and-1 free-throw opportunities, and Miami quickly closed a 35-24 deficit to 35-31. Virginia was 13 of 20 from the line. Miami returns home to face surging, 10th-ranked Duke on Saturday. Virginia plays at North Carolina State on Saturday.